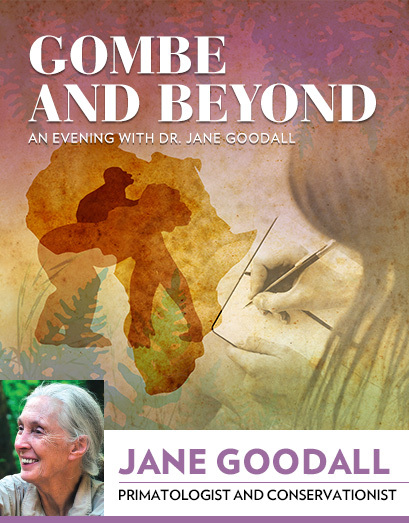 Thursday, March 31, 2016, 7:30 p.m.
A UN Messenger of Peace and one of the world’s foremost experts on chimpanzees, Jane Goodall is best known for her more than five decades of scientific exploration on the behavior of wild chimpanzees at Gombe National Park, which redefined the relationship between humans and animals. She is the founder of the Jane Goodall Institute and their environmental and humanitarian youth program, Roots & Shoots. Today Dr. Goodall travels nearly 300 days each year, devoting herself to conservation and animal welfare issues while sharing stories of hope and inspiring millions globally to make the world a better place for all living things. Photo courtesy of the Jane Goodall Institute. The opinions and views expressed at the Maverick Speakers Series do not necessarily represent the views of UT Arlington. If you need a special accommodation to fully participate, notification must be made five days prior to the event. For more information, please call the box office at 817-272-9595.